Amazing business products and services to try right now! You are here: Home / Uncategorized / Learn how your business will change by implementing these simple practices! Learn how your business will change by implementing these simple practices! If you’ve been reading my blog for a while, you probably know that I do the majority of my work from home. If you’re new here, I blog here at amyfillinger.com and at Amy & Brandon Adventures (our travel blog), and I’m also a professional photographer. If you run a blog or business, whether working from home or not, you know that it can be crazy. Business owners wear many hats, and it can certainly be overwhelming. I wanted to put together a list of products and procedures that help me run my blogs and business (somewhat) smoothly. I don’t have it all figured out, but I am doing a lot better than I used to! My productivity level is up, and having a workflow process is certainly helpful. Whether you run a business, or you’re thinking about starting one, there is bound to be something on this list that will make your life easier! These are some of the best products for small businesses (and blogs) that I have found. I just wanted to make a note that while some of these are affiliate links, most of them are not. Many of the products and services are absolutely free (or have free versions) and the paid products that I suggest are 100% worth the investment! For any business, you will need to have a website and a reliable hosting service. I always recommending being self-hosted through WordPress.org. I use Siteground for hosting on all of my websites. There are many other services out there, and I’ve used a few of them, but Siteground is the most reliable that I have found. For more information, check out: How to start a WordPress blog. Most businesses will need to use contracts at some point. I use Digisigner for all of my contracts. Most of my clients live in other states, and they love the convenience of online contracts. Digisigner contracts are legally binding, and you can use up to three per month for free. I use the paid version during my busy season, and go back to the free version when things slow down. I have used PayPal for years and have never had any issues. I use PayPal for payments and invoicing. Using pre-made template for invoices makes my life so much easier! I am not currently using this service, but I am considering it as my businesses continue to grow. I did a trial of Xero accounting software and I really liked it. It was simple, and very easy to use. I highly recommend this software, and will probably start to using it again very soon. Dropbox is a great service for sharing photos and files with clients, designers, assistants, etc. A basic account is free. I also use Pixieset for my photography business. It’s a great tool for photographers to send files to clients, and for clients to order products and prints. These two things were game changers for my business. I use templates for my contracts, invoices, and emails. Gmail allows you to have “canned responses” that can be inserted directly into emails. I have canned responses for photography inquiries, blog inquiries, and more. If you use canned responses and templates, make sure to customize them! I always use the clients name and try to include details that they included in their initial email. This way, I save time by using the canned response, but it doesn’t seem fake and scripted. I probably should have mentioned this first, because I’ve been using G Suite by Google for years. If you run a professional business, you want a professional email address. You can do this directly through Gmail with G Suite. G Suite has many other features, but I primarily use it for the email. I also love Google drive (where I store my contracts before sending them to Digisigner) and Google Calendar. If you don’t have a professional email address (like amy@amyfillinger.com) you need to go to G Suite right now and get that set up! It’s $5 per month, so there are really no excuses not to have one. I couldn’t find a daily task checklist that I liked, so I made my own! Click Here to get a copy of my free daily check list, this is what I personally use to keep myself organized every day! Between running a business, two blogs, having a family, kids activities, trying to stay fit, and life in general, it’s great to have one place to put everything that I need to do. The list also has a short shopping list, 3 main goals for the day, a place to track your water intake, and more. Don’t get me wrong, a blog is a business. This is particularly true if you are making money. I simply wanted to make it a different category since there are some things that I only use for blogging. I already mentioned using Siteground for hosting, so I will move on to my other favorite blogging tools. Once you purchase a domain and hosting, the first thing you’ll want to do is to install a nice WordPress theme. There are plenty of free themes available, but they will have branding on them from whoever made them. Of course this is only fair, but your site can look more professional by purchasing a theme. I use Themeforest for the themes on all three of my websites, and you can purchase them for as low as $3! One of the very first things that you should do when starting a blog is to set up Google Analytics. It’s good to know where your traffic is coming from, and what is bringing them to your site. I also recommend the Google Analytics Dashboard for WP (GADWP) plugin (it’s free! ), so that you don’t have to leave your site to check basic analytics. There are plenty of social media schedulers to choose from. I use a few of them, for a few different reasons. Facebook: Facebook has it’s own scheduler, and it’s very easy to use. I’ve heard that Facebook likes it when you use their scheduler, so that’s what I do. I’m not a Facebook expert (at all) but this has worked for me on my photography page, and I am using the same process on my blog pages. Pinterest: I recommend Tailwind, for Pinterest scheduling. I have used BoardBooster, but Tailwind has worked the best for me. Tailwind is an approved partner for Pinterest, so it’s nice to know that I’m not doing anything “wrong” by using their service. I’ve done manual pinning, and this is my preferred method lately. You can also check out this post for a VERY in depth look at using Pinterest for business. Instagram: I don’t use an Instagram scheduler. I do everything on Instagram manually. Tailwind recently became an Instagram partner, so I may try it but I have yet to do so. If you’re looking to start a money making blog, affiliate marketing is a great place to get started. It’s actually a lot simpler than you might think, and you can start even if you don’t have a large following. I highly recommend the course Making Sense of Affiliate Marketing. I don’t recommend courses very often, in fact, I’ve taken a couple of courses that I don’t recommend. However, I truly believe that Making Sense of Affiliate Marketing is a worthwhile investment for any blogger looking to boost their affiliate income. Speaking of Affiliate Marketing, being an Ultimate Bundles affiliate is a great place to start. They offer bundles for parenting, blogging, fitness, natural living, and more. Whatever your niche, there will probably be a bundle that you can promote. When you start a blog, you’ll want to set up an email list. I’ve been using MailChimp for quite some time, and they’re very popular for new bloggers. Your mailing list will be free up to 1000 subscribers. I am considering moving to a new provider, but for the time being, MailChimp works for me. 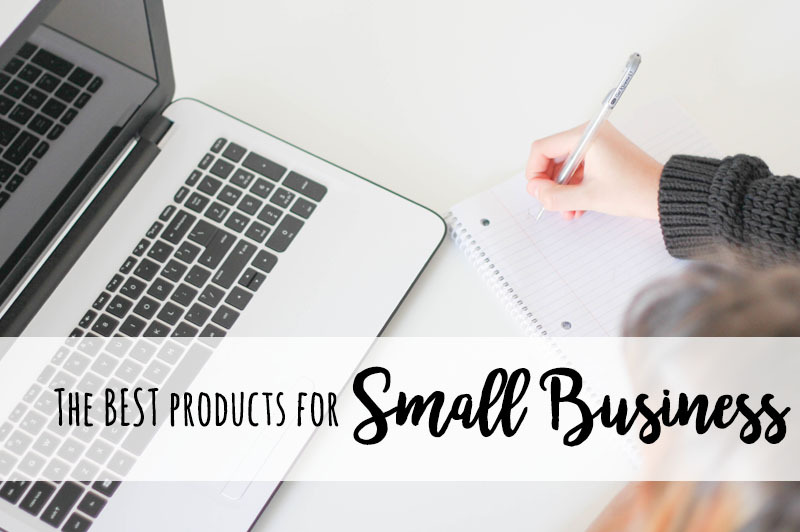 There you have it, these are some of the best products for small businesses and blogs that I have found so far. If you have anything to add to the list, I’d love to hear about it in the comments! Don’t forget to download my daily checklist, and let me know what you think about it! If you enjoyed this post, make sure to share it on Pinterest!